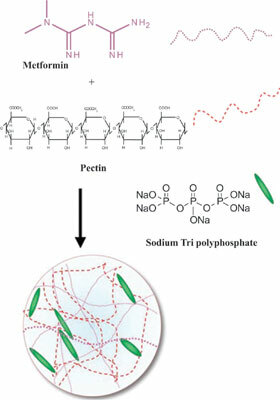 Aim: The present investigation was aimed to formulate and evaluate Metformin loaded pectin (PCM) nanoparticles (NPs) for sustained action for management of Type 2 Diabetes Mellitus (T2DM). Method: The nanoparticles were formulated by ionic gelation technique. The nano-formulations were subjected for the analyses of entrapment efficiency and drug release stud for 12h. The optimized formulation examined various in vitro characterizations such as particle size, zeta potential, surface morphology and FTIR studies. The in vitro heamocomptability, protein binding stability and glucose uptake studies were performed with nanoparticles. Results: The PCMNP-4 showed drug entrapment efficiency, 68 ± 4.2 % and demonstrated favourable in vitro prolonged release characteristics. The mean particles diameter of optimized formulation was 482.7 nm and 0.270 poly dispersity index (PI), had spherical shape and zeta potential of (+38.85 mV). In addition, the nanoparticles were reasonably stable in the presence of excess bovine serum albumin, which suggested that the nanoparticles may also be stable in the blood stream. The percentage of haemolysis induced by Metformin and placebo PCNPs were less than 5%. The results indicated that the PCMNPs are hemocompatible and therefore, safe for oral administration. The glucose uptake was increased 1.5 fold in RBCs and L6 skeleton muscle cell line compared with Metformin. Conclusion: Hence, the designed nanoparticle system could possibly be advantageous in terms of prolonged release, to achieve reduced dose frequency and improve patient compliance. Ionic gelation, L6 skeleton muscle, metformin, pectin, nanoparticles, diabetes mellitus.